Evolve, the up-coming asymmetrical multiplayer shooter from Turtle RockStudios, of Left 4 Dead fame, made a big splash during its Game Informer cover reveal last month. Recently a passel of gaming journalists, such as Kotaku’s Kirk Hamilton, got to check out the game, which is due to launch on the PS4, Xbox One and the PC later this year. 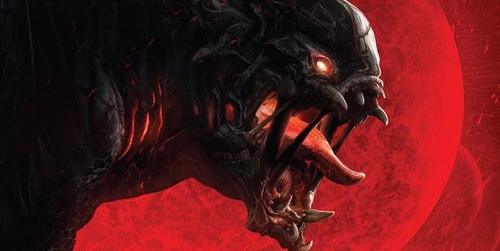 Mr. Hamilton compiled six minutes of Evolve footage, so give it a watch. Evolve looks like a lot of fun, and this video (I prefer text explanations to narration, at least in this case) shed a lot of light on some mechanics of Evolve that I was previously fuzzy on. The only thing I don’t dig about Evolve are the human characters, but that’s a small gripe. So, how is Evolve shaping up for you? Not content to just be the creative force behind one of the most successful cooperative gaming series on the market, the makers of Left 4 Dead, Turtle Rock Studios, is at it again with Evolve, their next-gen only asymmetrical co-op shooter. In Evolve, four human alien-hunter characters will battle against a single player-controlled creature. While that may sound hilariously lopsided at first, the hook of Evolve is that the monster grows larger and more powerful with each match that goes by. Judging by the short snippet from the Game Informer February cover reveal, each human will have their own bag of tricks, but they alien they’re hunting will be more than able to hold its own. It’s a pretty cool competitive twist on the co-op scene, and the fact that its next-gen/PC only means that Turtle Rock will be able to cram in plenty of bells and whistles. February’s Game Informer will have a bunch more information about Evolve, but for now consider me intrigued. While I never exactly got into Left 4 Dead’s competitive side, Evolve sounds like enough of a different beast that I’d be willing to give it to go. Having an ever-expanding array of powers and abilities as the alien sounds like it might make for some hilarious screaming matches if you’re on the human side of things. What do you guys think about Evolve? Is your interest piqued?